In a quest to up my species targets, I decided on a trip to Brighton Marina on Friday just gone to have a crack at crossing plaice and herring off the list. I arrived on the east arm at about 8am to filthy weather, chucking it down with rain and just the slightest north easterly breeze. The arm was empty of people so I had the choice of where to pitch up, so I settled for bay 25 – one of my favourites. I got setup, one rod with simple running ledger with blingy hook length to target plaice, the other rod with a small Sabiki string to get the herring. 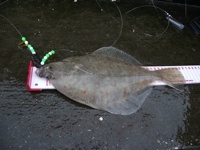 Plaice rod was baited up with lug plus squid tipping and chucked out at distance. I then started working the sabikis but could only manage a few chucks at a time before having rest due to my back giving real grief. 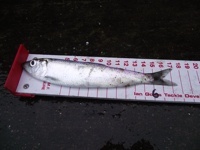 I had the first herring at just after 9am which sadly, turned out to be the only one of the day. 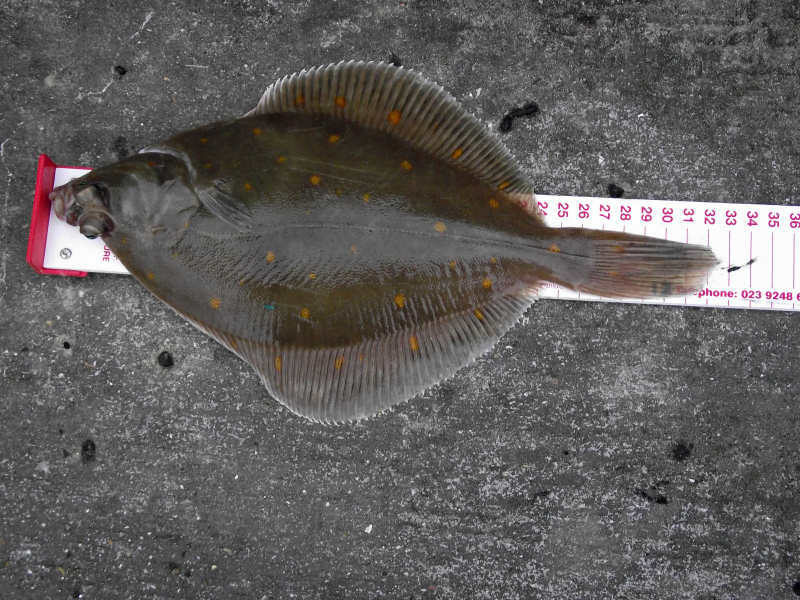 The first plaice came just after the herring, so that was both targets achieved in reasonably quick time. The rain was relentless and a real pain in the arse, it wasn’t heavy, just that horrible persistent stuff. The breeze had started to drop had even stopped ruffling the surface of the flat calm sea. Another two plaice were landed about an hour after the first one. It was turning into a tidy session considering i was now well into the ebbing tide and the sea was dropping quite quickly. With no herring showing, I took the sabikis off and replaced them with a two hook flapper, baited with lug and squid. I stuck on a 2oz plain lead and chucked it as far as the floppy rod would allow. Another plaice landed which turned out to be the largest of the day at 34cm and a whisker under 1lb (13oz). It had hit both baits on the flapper and taken them well down (all had apart from one) and so was swiftly dispatched. I was considering packing up as everything was getting soaked through and I had already accomplished what I had set out to do. I decided to stick it out anyway see how far I could go into the ebb and still nail a plaice. At just on midday, I was slowly retrieving the flapper, hoping that the movement might trigger a response from a plaice as the static bait had long since stopped tempting them. 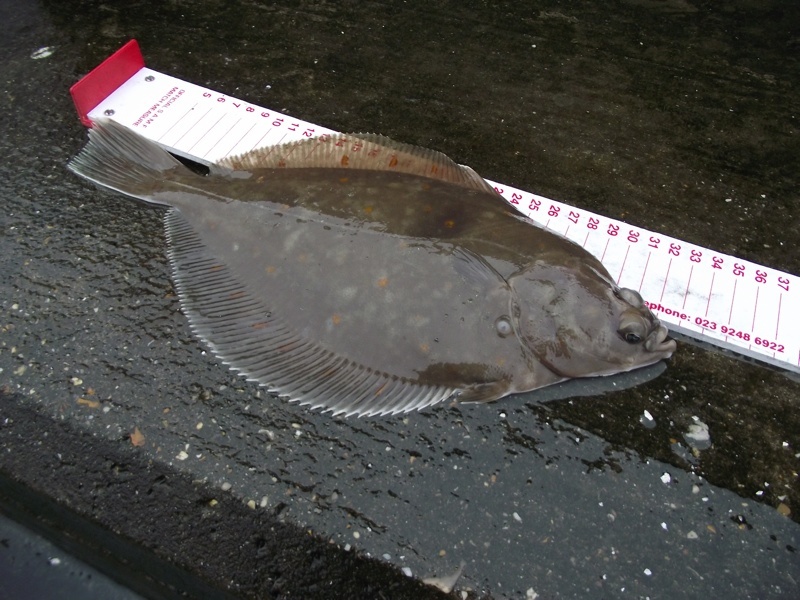 Just few yards from the wall, the bait was nailed and soon, another plaice was landed. It was around this time that I was joined by local guide and all round good bloke, Fishyrob. He was targetting the same as me but was going down using the artificial route to try and tempt the flatties out. By this time, we reckon they had all moved on with the dropping tide, as neither of us could manage any more. Time was pushing on and I needed to be away sharpish – and so it was an extremely wet and happy Vic headeing off home to clean up and get ready for work. Now looking forward to the next session. Decided to have another crack at the plaice on Brighton Marina yesterday and fish a few hours up and over the 10am high water. By 6.30am, I was at the gates to the East arm waiting for Frank to open up, which he did pretty soon after I arrived. It wasn’t too long before I was in my chosen spot. It was a chilly morning but not overly cold with very little wind and an overcast sky. The sea was clear and flat and all things looked good for a great day apart from the tide being a little short. There was only one other guy waiting at the gate and I had my spot all to myself. It pays to get down there early or you risk getting to a packed wall with not much space to fish. Dave, at The Tackle Box, who runs the fishing concession reckons the damage to the wall should be finished soon, at which time, the rest of the wall should be open. I set up using the familiar running ledger, long trace with beads and attractors, ending in a size 2 hook baited with lugworm and long, thin squid strips. This was cast out only about 50 yards or so and then I settled to a coffee and pondered if I should have a go at the herrings, or just fish for the plaice. 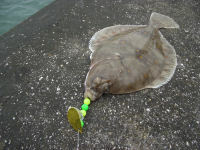 Just after 7am, I had a knock on the rod and in quick fashion I had my first plaice of the day on the deck. It wasn’t the largest in the world but it was over the minimum size limit and in view of the fact of it bleeding heavily from a deep hook, it was dispatched and put in the infamous ‘dinner bucket’. I re-baited and chucked out again and while having another coffee, two regular fishing nuts turned up – local guide, Fishyrob and ‘ Mesito’ Steve. After the usual banter and insult trading, they too were fishing. To say the fishing was slow, would be an understatement; it was very slow. I abandoned my morning’s self imposed ‘no herring’ rule and soon had a string of size 12 Sabikis out and being worked on my other rod. While working away, I noticed a nod on the other rod and in a quick retrieve and swing over the wall, another plaice was landed. Smaller than the first one and nicely lip hooked, this one went back. 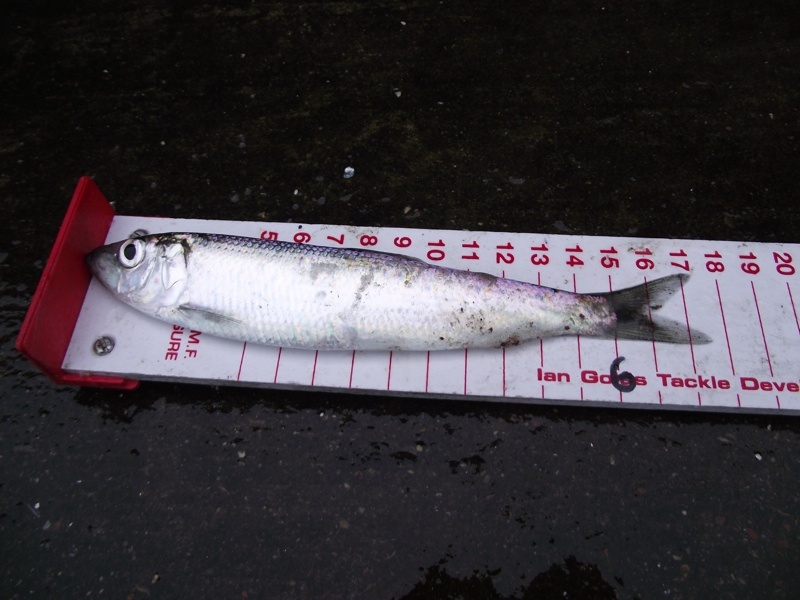 Back to the herrings which were being a bit elusive, although they did come up in ones and twos. Late in the morning, the clouds parted and we were briefly bathed in lovely warm sunshine; it wasn’t long though before the clouds came back and it was time once again, to stick a jacket on. Due to other commitments, I had to leave the marina by 1pm and by the time it came around, the fishing had slowed further with the dropping tide. 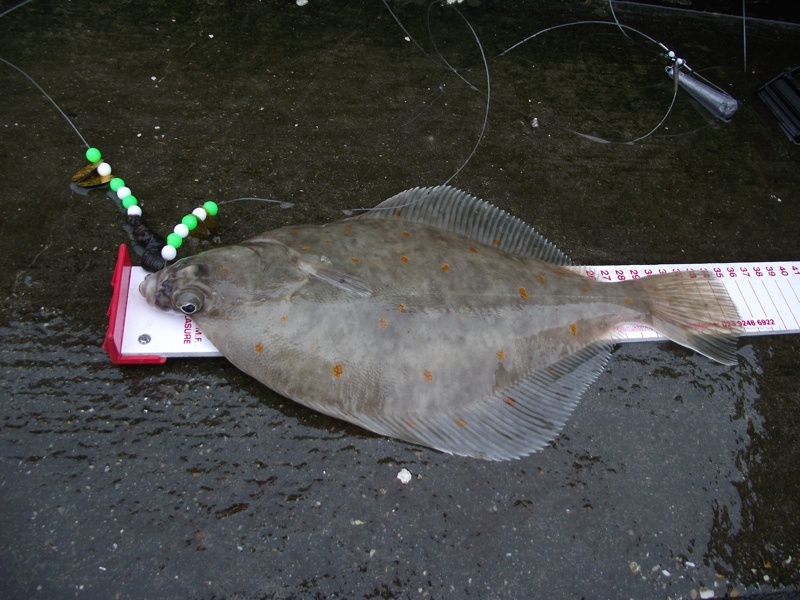 I did however, manage another two plaice which sadly were under sized. Rob, donated one of his catches which had again been deeply hooked and unlikely to survive after release. So with a brace of plaice and a nice few herrings, I left, leaving Rob and Steve to carry on fishing. The plaice would be for Anna’s dinner, while I would divide the herrings into some for my dinner and some to be frozen for bait. It wasn’t a too shabby session and I was pleased to walking away with some rewards for the hours put in. Another early start on Friday morning in the hunt for plaice. I got to the east arm of Brighton Marina at about 7am and I have to say though, from the start, I wasn’t that hopeful. 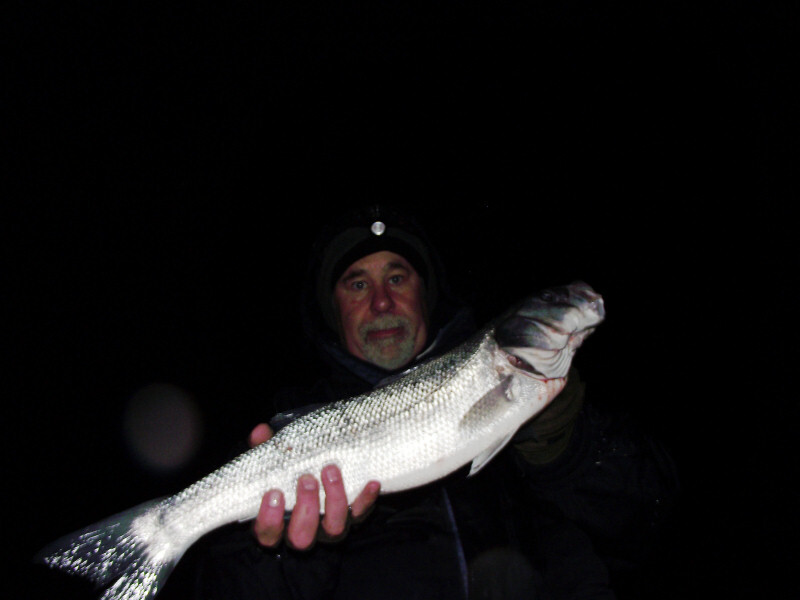 Conditions had changed to a South West breeze ruffling up the water a bit that still remained clear. The tides Weren’t ideal and I would be fishing down to the 11.40am low water and some of the flood but missing the 6pm high water due to work. The temperature had dropped a bit too making it a bit chilly throughout the session. AS I pitched up at my chosen spot, another WSF nut, Martin (Bubbles) slotted into the bay to my left and Fishyrob a couple of bays down from there. Also down for the day to do an article, were some guys from ‘Sea Angler‘ magazine. I decided to concentrate on plaice this time, so was not going to set up a rod for herring. Main rod was rigged with an up n over ledger which allowed for better casting with a long hook length. The hook length was outfitted with some ‘bling’ beads and reflective spinner blades and ended in a size 2 hook baited with lugworm tipped with thin squid strip. Fishing was so slow, that I ran the risk of going into a vegetative state, so despite earlier plans, I eventually broke out the herring rod and had a go just to do something active. This wasn’t any better and even though I gave it a decent go, the herrings weren’t exactly forthcoming. Meanwhile, in the next bay, Bubbles was bringing them out with alarming regularity. At one point, I accused him of having a large bucket of them down the side and he was fishing into this. I did eventually manage three, which I donated to Dave from ‘The Tackle Box’ as he seemed to be doing a collection of them to try. After this though, I packed up the herring rod and put all my effort into plaice. This wasn’t to last though; with time moving on and thinking about packing up to head home early, I retrieved my plaice rig only to find one of the critters had hooked up without me knowing. It was deeply hooked, taking down a couple of beads as well as the hook. I cut the line as close to the hook as I dare and released it back into the water. Deciding that that was a good time to call it a day, I packed everything up and headed off. It will probably be a few days now before I can get out again and have to decide whether to have another session or two on the plaice or have a go at an early squid or even maybe going after bass on the beach. Decisions!